Utopia (noun) : a place, such as a town or city-state, in which everything is perfect; generally considered either fictional or temporary. Such is the origin of the name Junetopia, a 3-day Quad Cities event that no one will want to miss. In its third year, it was originally conceived as a one-time celebration of the area arts communities. Now, the festival is rapidly becoming a cornerstone among local musicians, comedians, artists, crafters, filmmakers, and performers of all kinds. Currently billed as an annual community-strengthening event, Junetopia continues to function in the spirit of its namesake-- thanks to the folks at Utopiugly Productions. Working with Safe Harbor Records and Promotions, they’ve booked dozens of bands that are distinctly local and regional. The festival continues to feature local artists in locally-owned venues selling locally-produced goods. All profits will be split evenly between the Humility of Mary Shelter, Humility of Mary Housing, Kings Harvest Ministries, and the Kings Harvest Pet Rescue No-Kill Shelter. Past events have been so successful that Utopiugly was able to add a winter sibling event called Jantopia, attracting artists from across the nation. This June, even more new acts ­– such as dark horse favorite Jack Lion from Iowa City – will take the stage alongside popular returning artists – such as hometown heroes Condor and Jaybird, back for their third ‘topia, and Sister Wife, a duo whose amazing new album Trap House comes recommended by the surgeon general. A lasting utopia is realistically unattainable. Junetopia comes pretty close, however, thanks to the hard work and effort of Eric Murphy. Murphy is one of a growing number of young locals with a passion for community involvement. He’s generally not a manic, fast-talking guy, but when I catch him on the phone between meetings, the dude is breathless. Though the bands have all been booked, there’s still a mass of preparation left, especially with some of the major changes coming to this year’s fest. For example, past Junetopias have taken place at Rozz-Tox in Rock Island. This year, Rozz-Tox – alongside neighbors Laborspace and Rooster’s – will host Sunday’s performers only. The Figge Art Museum and the Village Theater will host Friday and Saturday’s shows, respectively. Friday will start out rather modestly at 5 p.m. with a lineup that is perfect for the Figge. A performance featuring musicians Jeff Carl and Jason Horras will include a visual element through collaboration with QC Filmmakers. The uproariously funny Andrew King, host of The After Hour and Triple Crown Comedy, brings a stand-up set and artist David Hunt will be working on live portraiture and assemblage. And it’s a Quad City-centric music set, with Closet Witch (aggressively mathematic grindcore), We Also Let Blood (experimental noise explosions from the counter-intuitively quieter half of Safe Harbor’s partnership), and more. Aside: It’s possible that partnering with the city of Davenport and the Figge will encourage further civic cooperation with blossoming organizations like Utopiugly. Murphy and likeminded organizers have enjoyed success through working together, and much of this is attributable to the fact that they are mission-based. Because everyone’s on a mission and has a clear, definable goal, all are driven to help each other make large events like Junetopia work. Cooperation improves not only their own professional lives, but community morale and the local economy, as well. Day 2 starts at 2 p.m. at another long-time community center – the Village Theater in the Village of East Davenport. While the second day is traditionally livelier than the first, it won’t get so crazy that you’ll have to leave the kids at home. And speaking of kids, be sure to check out Pulsing, a digital sound artist from Cedar Falls who likes to make chiptunes with old Gameboys and the like. The technique is relatively new and inspires listeners to imagine what else we might do with sound, exploring beyond traditional musical instruments. More hometown favorites on Day 2 include Waking Robots (sounds like: an alternate-reality Tori Amos where she's more psychedelic and rocks harder and also plays with a dude), Soultru & The Good Company (instant classic hometown grooves featuring a portion of The Blacklights, who are on hiatus while singer-songwriter EmJay is away at school), and the aforementioned Condor and Jaybird (their sets never fail to take everyone in a 50-ft. radius to a higher spiritual plane). Be on the lookout for comedic artist Wayne Lyter as well as more than a dozen acts from across the Midwest. On Sunday, the fest returns to its home base on the Illinois side starting at 2 p.m. This is a special homecoming; stretching down 3rd Avenue, from 21st to 22nd Streets, it will essentially be a giant block party. It’s a great time to check out what’s going on over at Laborspace, the arts workshop that’s also home to Futureappletree Records’ Studio 2, birthplace of some of your favorite Daytrotter sessions. 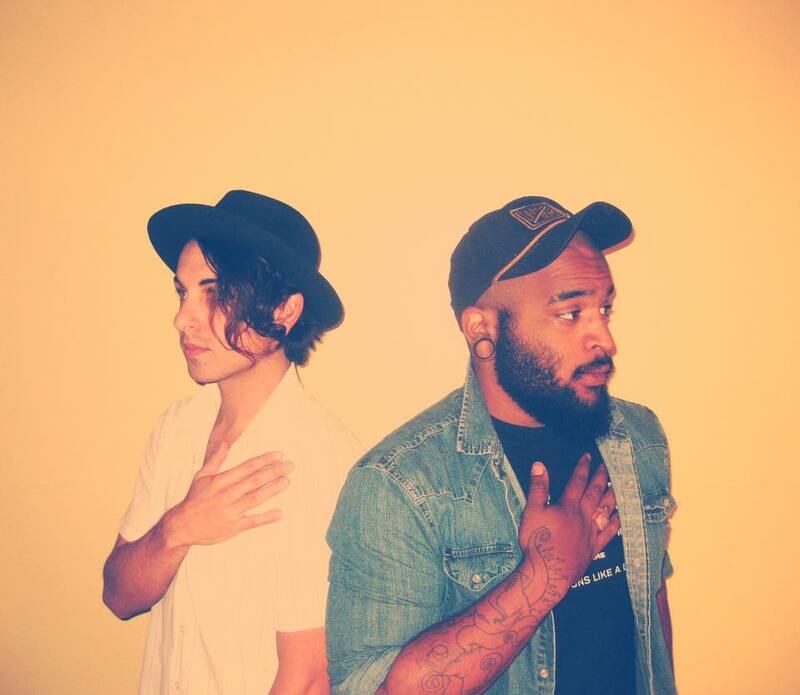 Be sure to catch Metasota, an emcee with an assertively earnest voice. Hailing from the Twin Cities, Metasota is one of a number of great rappers to emerge from that area lately. If you like rhyme, keep an ear to the north. Sunday features the most out-of-town acts, though local acts include the likes of Behelit (METAL!) and Art Haus Eviction Notice (Murphy’s own project with fellow Utopiuglier Baby Jayne). Attendees can also catch a screening of Nihilist Nights, a Motive Direct Production and the latest film by Sherrard-based artist Sam Thomas. You can use these beautiful paper tickets to get into the show, and then put them in your scrapbook so you can brag to your grandkids about how you went to one of the very first Junetopias. Your best bet for tracking these down the fancy tix is to hang out at Rozz-Tox or Ragged Records, or stop in for a show at Daytrotter. OR buy tickets online. Three-day passes are the best value (only $25! ), but single-day passes are available for the poor souls who can’t join us for the full weekend. See the flier below for the names of every performer. 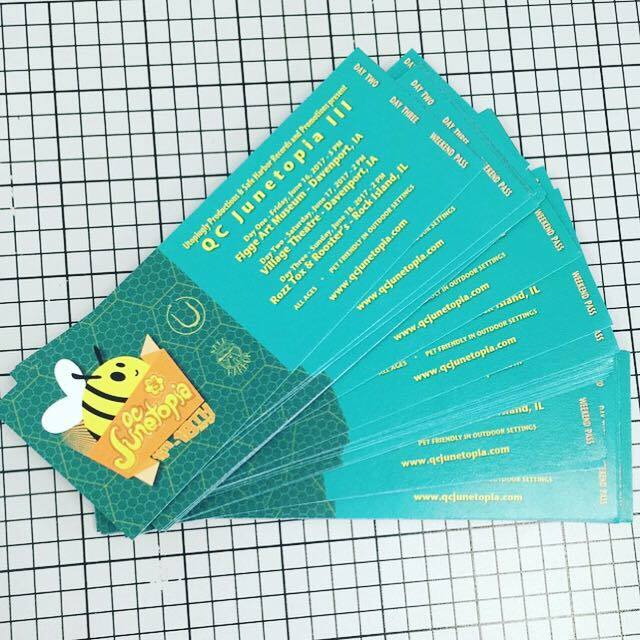 The flier and the cute little bee logo are designed by Alex Crist, by the way. He makes a ton of promotional art for local bands and businesses. Want an advanced taste of Junetopia? You can hear some of the bands on QC3° Radio, the digital radio station that features all local and regional musicians. This sounds like a great community-building event! Thanks for the post! Definitely going! Great write up!